Discussion in 'Sacraments and Holy Orders' started by Tuxedo America, Sep 16, 2017. My feeling is every Eucharist is a miracle. Achilles Smith, Aidan and Anne like this. Thanks for this, it is helpful. The Lord's Supper is a memorial. Scripture plainly taches this. But it is not merely a memorial. The bread and wine are a communion with Our Lord's Body and Blood, which the bible also plainly teaches, not just a feeling in the heart. But it is not merely a communion. For those who recieve it worthily, discerning it by faith for what it is, the conscrated bread and wine ARE Christ's Body and Blood. Does this mean the the bread transforms into a piece of corpse flesh and the wine into clotting blood? Certainly not! In fact there is no outward change to the elements at all. Christ's presence in the elements is heavenly and spiritual, as befits Our Glorified Lord and His Glorified Body. Tom, anawkwardaardvark, Aidan and 1 other person like this. Which "Early Fathers"?. There were many "synods" by the early Christian Church that formulated and decided on these theological questions some based on "tradition" and others based on "scripture. Are Anglicans of all stripes united in the belief that Jesus is present in the Eucharist? Is there room for disagreement among individual churches without breaking their communion with the others? I'm pretty ignorant of anything not Latin-rite Catholic. I'm not a theologian or part of the ordained clergy. When I receive the consecrated wafer or host and the consecrated wine it takes real hard faith for me to believe that Christ is present in those forms. But that is the hard part of being a Christian - having faith. As far as I know the seven ecumenical councils do not address the question of whether Christ is especially present in the Eucharist but the Church Fathers are pretty consistent on this question. Now the Romans and to a lesser extent the East assumes that a spiritual presence means it cannot be a real presence (which is an oddly very anti-sacramental understanding of the spiritual), but the Scriptures and the Formularies seem to accommodate a Reformed (non-Zwinglian) understanding of the Eucharist though perhaps a Lutheran understanding of the sacramental union could be accommodated. I have as a side project for a rainy day in the library to pin down precisely what Zwingli's (and Bullinger's) views really were, but what I can say is that I do not think the Lutheran view of the Eucharist can be applied without mincing our two confessions and twisting them away from their plain sense. The traditional Anglican view simply is not reconcilable with the Lutheran over whether Christ is physically present, and whether He is partaken of by the mouth by all who eat the bread, or partaken of by faith only by those who have it. I found this work extremely helpful. Calvin and Cranmer seemed to be saying the same thing. Read it for yourself, or don't, it seems you have already made up your mind. I think you have misunderstood what I have posted. I was not referring to the Reformed Church but the teachings of John Calvin. You have flipped that and misread what I posted. Calvin actually did say it clearly, more than once, he was overruled by the Council in Geneva. What the Council decided became apart of the Calvinist/Reformed Church tradition. I have provided information to help flesh it out for you. The other point is, that if this pretend civil government of Geneva was full of heretics who denied the truth of the Lord's Body and Blood, then it was John Calvin's duty to resist and die if necessary to protect the integrity of the Gospel... Why didn't he? I wrote, "I found this work extremely helpful. Calvin and Cranmer seemed to be saying the same thing." You wrote, "What about those of his followers and adherents..." and missed the point. PS: You are mistaken, the Reformed view is the real presence. The memorial view is Anabaptist and Arminian Baptist. Wiki on the Reformed/Presby teaching of the real presence. Many Reformed, particularly those following John Calvin, hold that the reality of Christ's body and blood do not come corporally (physically) to the elements, but that "the Spirit truly unites things separated in space" (Calvin). Following a phrase of Augustine, the Calvinist view is that "no one bears away from this Sacrament more than is gathered with the vessel of faith". "The flesh and blood of Christ are no less truly given to the unworthy than to God's elect believers", Calvin said; but those who partake by faith receive benefit from Christ, and the unbelieving are condemned by partaking. By faith (not a mere mental apprehension), and in the Holy Spirit, the partaker beholds God incarnate, and in the same sense touches him with hands, so that by eating and drinking of bread and wine Christ's presence penetrates to the heart of the believer more nearly than food swallowed with the mouth can enter in. This view holds that the elements may be disposed of without ceremony, as they are not changed in an objective physical sense and, as such, the meal directs attention toward Christ's "bodily" resurrection and return. Actual practices of disposing of leftover elements vary widely. Reformed theology has traditionally taught that Jesus' body is seated in heaven at the right hand of God; therefore his body is not physically present in the elements, nor do the elements turn into his body in a physical or any objective sense. However, Reformed theology has also historically taught that when the Holy Communion is received, not only the Spirit, but also the true body and blood of Jesus Christ (hence "real") are received through the Spirit, but these are only received by those partakers who eat worthily (i.e., repentantly) with faith. The Holy Spirit unites the Christian with Jesus though they are separated by a great distance. See, e.g., Westminster Confession of Faith, ch. 29; Belgic Confession, Article 35. The supper of the Lord Jesus was instituted by him the same night wherein he was betrayed, to be observed in his churches, unto the end of the world, for the perpetual remembrance, and showing to all the world the sacrifice of himself in his death, confirmation of the faith of believers in all the benefits thereof, their spiritual nourishment, and growth in him, their further engagement in, and to all duties which they owe to him; and to be a bond and pledge of their communion with him, and with each other. 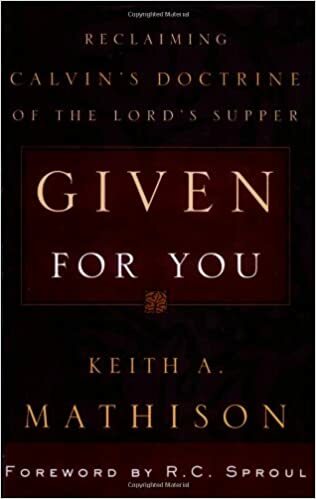 During the Reformation both Reformed and Lutheran Churches exhibited an evangelical intention when they understood the Lord's Supper in the light of the saving act of God in Christ. Despite this common intention, different terms and concepts were employed which. . . led to mutual misunderstanding and misrepresentation. Properly interpreted, the differing terms and concepts were often complementary rather than contradictory. In the Lord's Supper the risen Christ imparts himself in body and blood, given up for all, through his word of promise with bread and wine ... we proclaim the death of Christ through which God has reconciled the world with himself. We proclaim the presence of the risen Lord in our midst. Rejoicing that the Lord has come to us, we await his future coming in glory ... Both of our communions, we maintain, need to grow in appreciation of our diverse eucharistic traditions, finding mutual enrichment in them. At the same time both need to grow toward a further deepening of our common experience and expression of the mystery of our Lord's Supper. Can anyone tell me what citations Romanists use from the fathers to support the idea that they believed in transubstantiation and not simply the real presence, and what can be said against those claims? Hoarder, the Fathers are often general enough in their assertion of the reality of Presence in the Eucharist that it can be interpreted using many different hermeneutics. Anyone who believes that transubstantiation is the mode by which the bread becomes full of the presence of Christ will say "ah, you see? they taught what I teach", because to them, real presence = transubstantiation. The Fathers simply were not Scholastic theologians, so when they speak of the sacraments or mysteries, it isn't necessarily the same sense as in the thinkers of the 12th-14th centuries. Ambrose of Milan's "On the Mysteries" is a fascinating place to start. The first half is about Baptism, the second about the Lord's Supper. Incidentally, he only identified these two things as the mysteries/sacraments of the faith, just as protestants do. Odd to see the Puritans labelled as memorialists. "VII. Worthy receivers, outwardly partaking of the visible elements, in this sacrament, 51 do then also, inwardly by faith, really and indeed, yet not carnally and corporally but spiritually, receive and feed upon, Christ crucified, and all benefits of His death: the body and blood of Christ being then, not corporally or carnally, in, with, or under the bread and wine; yet, as really, but spiritually, present to the faith of believers in that ordinance, as the elements themselves are to their outward senses." The Puritans have had a complicated and checkered history with regards to the Sacraments. As you know, the Reformed Baptists abandoned the use of the word 'Sacraments' altogether, and while the Presbyterian Reformed (if you will) didn't go that far, they did embrace both Calvin and Zwingli as the fathers of the Reformed tradition. Calvin allowed for a form of real presence, but Zwingli famously did not. So within the Reformed tradition itself there has been those who affirm and those who passionately deny any kind of real presence, from the malignant influence of Zwingli (Luther detested Zwingli). That brings us to the present, where I am hard-pressed to find the OPC, or the PCA, defending the real presence with any kind of energy; effectively they have adopted the memorialist position almost by default. So while the tradition is checkered and unequivocal, unfortunately there is enough counter-weight there that the Reformed have not unequivocally taught the Apostolic faith, on the doctrine of the sacraments (they have a similar major issue with Baptism). Hi, new member here. I was raised Roman Catholic and remained RC until my late 20s, when I felt led to fundamentalist Protestantism. But after 30+ years of such churches, I was yearning for the traditional music and regular communion, so the Lord led me to an ACNA Anglican church where I've been for about 4 months. I never thought I'd return to a liturgical church, but there I am and it is wonderful. It feels like home in a way that even the RC churches never did to me. In reading web-based posts of early fathers' statements regarding eucharist, I stumbled across this forum! Late to this conversation, but here's my two cents. First, the RC definition of Real Presence is not the same as some of your definitions. In the RC view, Real Presence means the physical body and blood plus the spirit and soul and divinity; i.e., ALL of Jesus. Whereas I think many of you use the term to indicate something a little bit less extreme (no physical flesh & blood). Now, when a RC says the bread and wine change in substance into Jesus' physical flesh and blood, my question would be, which one? They must mean the mortal flesh and blood which Jesus had prior to His ascension, don't they? Or do they mean His imperishable (ascension) body? Well, therein lies a problem. Jesus' imperishable body is a body of flesh and bone (Luke 24:39), but is it a body of flesh and blood? Jesus poured out his blood for our redemption, and blood is a substance that carries needed nourishment to the tissues while carrying away impurities; I am of the opinion that Jesus' immortal body neither needs nor contains any blood. So if the RCs mean that the bread and wine literally turn into Jesus' mortal flesh and blood, then they are eating and drinking something earthly and corruptible; how would this confer any blessing? The early fathers' writings contained many references to Eucharist as Jesus' body (or flesh) and blood. And although they were quick to call out heresies, none of them called it heretical to regard the elements as Jesus' body and blood. Yet the formal doctrine of transubstantiation was not spelled out by any of them, nor do I believe any of them thought of it in that way back then. And no sensible purpose is served by an alleged change in substance; as Jesus pointed out, His words are spirit and life but the flesh counts for nothing. Besides that, drinking blood was expressly forbidden and I don't think Jesus would tell us to do something that creates an appearance of evil. This is why I believe that the Anglican view (as the BCP teaches it) is the most sensible view. Jesus' flesh and blood are present spiritually, but the matter (or physical composition) of the bread and wine remain just that: bread and wine. It is just my opinion, but I feel most of the strife and denominationalism that we see in Christianity is the result of certain theologians attempting to explain the inexplicable. The Scriptures and the early Fathers clearly refer to the Eucharist as the body and blood of Christ. Problems, however, arose when there was an attempt to explain exactly what this means. Our faith is full of mystical and symbolic references which are often not clearly explained, an example being the last days (the eschaton), the atonement (for which there are several theories) and the nature of the Trinity. The Roman Church in particular has all-too-often tried to define things that really can't be understood by us. One of the Anglican Church's strengths is that it does not attempt such detailed explanations to these things; it allows its adherents greater room for individual interpretation.